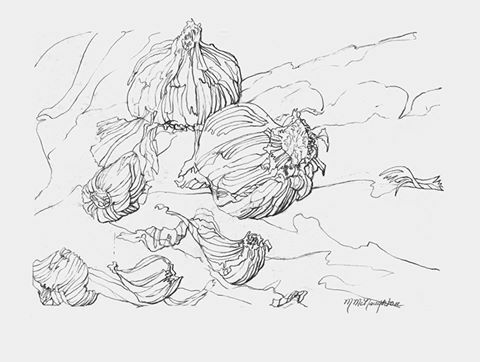 I’m showing the informative nature of the contour as it provides the framework for the finished gradation of garlic and cloves. Notice how the contour allows you to reveal your thought process of compositional considerations, the light source, area of emphasis. Once you have determined those elements, you are free to keep your eye on the subject and allow your personality to flow out onto the page. At this point, I keep my eye on the subject, let my hand become an extension of the eye, and rarely look at the surface of the paper. 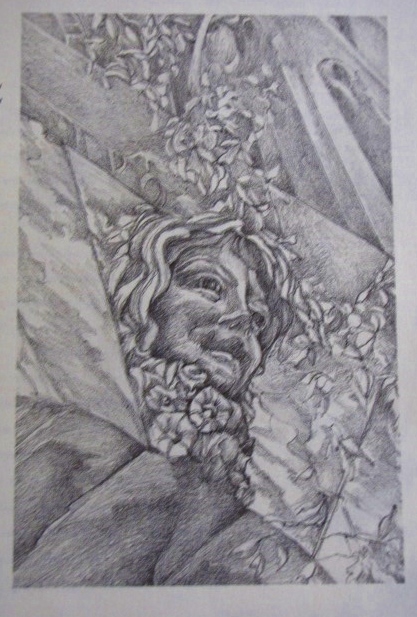 The contour line moves from light to dark describing the three dimensional nature of the subject, the light source, and the storyline you have set forth. Notice how my contour is curvilinear in nature. Yours will be very different. 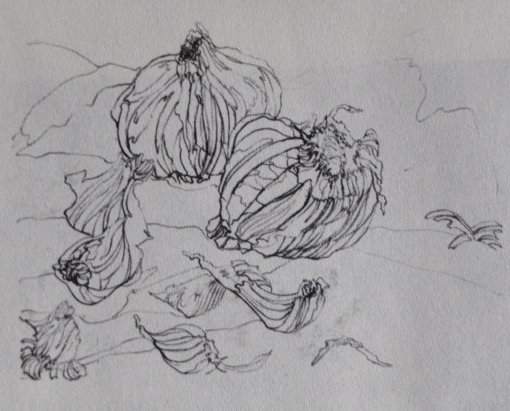 You can find examples such as these in my book The Little Book of Drawing; a Friendly Approach. 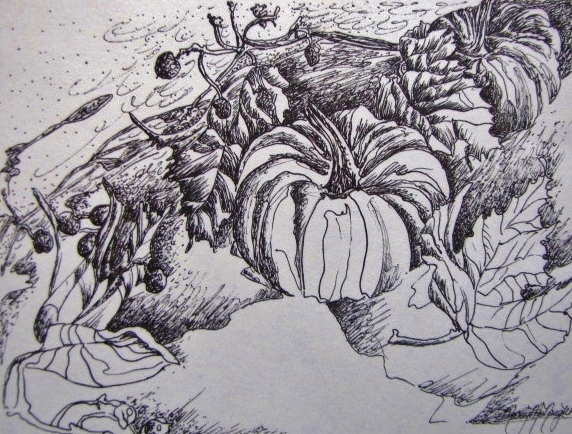 My teaching style is encouraging in nature and allows you to try different media, techniques, and to find your own personal style of story telling through drawing. 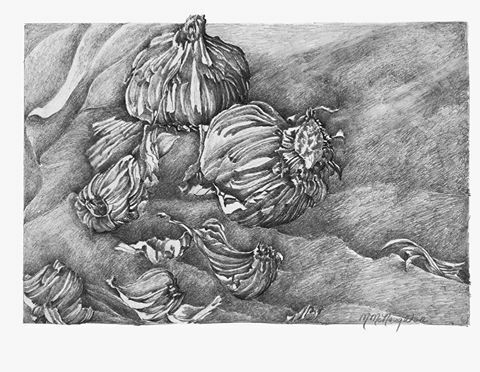 This is the same still life of pumpkins using a variety of textural techniques such as stippling, hatching, and scribble instead of just stippling. One gets a very different effect here; perhaps a more energized drawing. 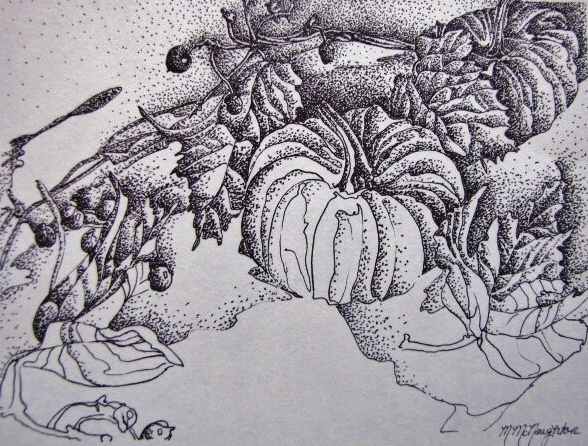 Here is a contour and finished gradation in stippling of a Fall still life. The contour provides me with the framework for the gradation. I even included the small letter s’s to indicate where the shadows lay. These notations whether on the page or in a notebook help you as the artist remember key elements. The contour exists on it’s own in places as it leads you in and out of the composition. 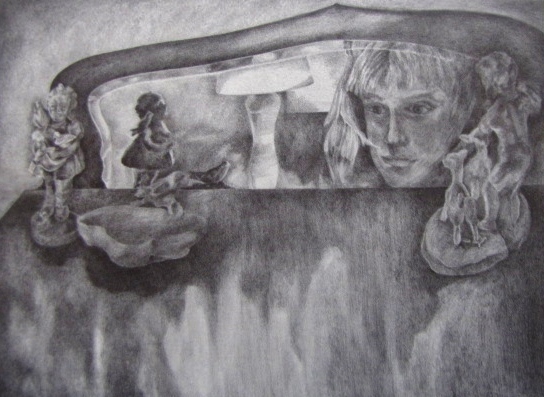 A drawing of Lauren when she was young peering into a mirror on a music cabinet. Notice how the value spectrum really opens up to include whites to very darks leading you as the viewer into the looking glass. 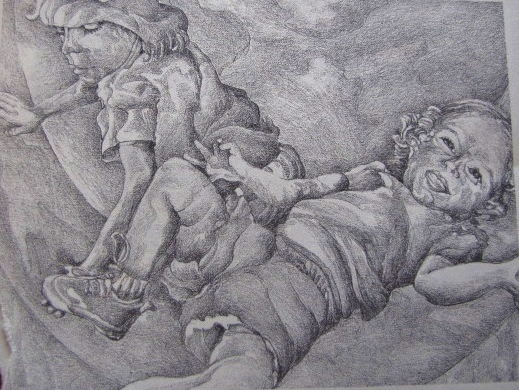 At last, the final drawing of a three part series of Anna and Clare in a tunnel at the playground. The first shows them contemplating things, the second; beginning to move, and now, they are in full motion. Whee!! 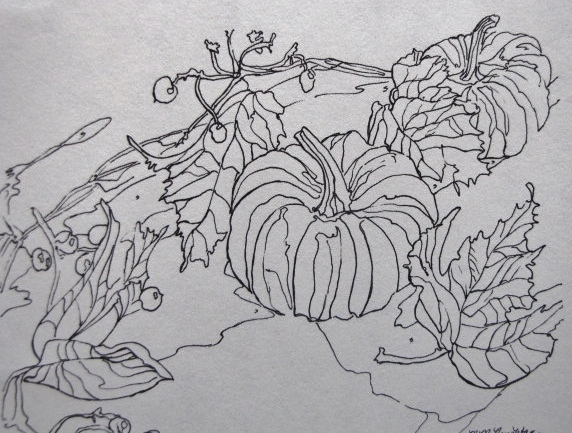 Again, I’m showing the contour or line drawing with the finished gradation. Serial imagery allows you to take full advantage of a train of thought. 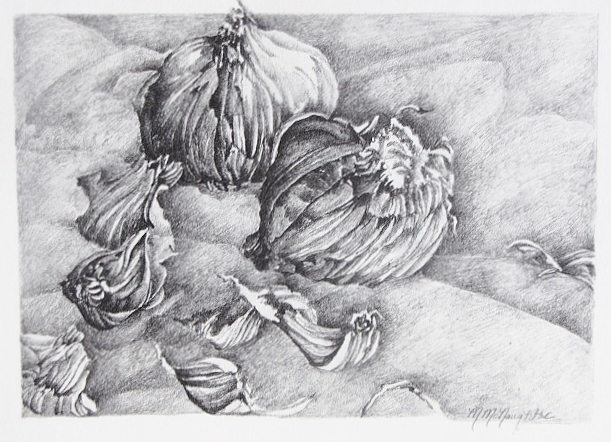 You are currently browsing the gradations category at Dr. Mary McNaughton and Drawing.